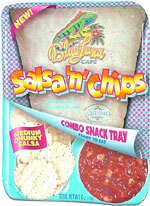 Taste test: This handy little snack kit combines salsa with small round tortilla chips. The chips are OK, but not particularly tasty or crisp, but that doesn't really matter, because the salsa is excellent, very flavorful with some mild heat. That's very impressive salsa, considering the kind of package that it came in. Smell test: The dippin' sauce smells spicy and really good. 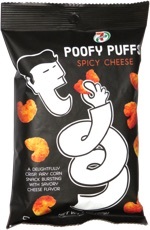 The chips have no particular msell.